LESLIE JEAN KNACKSTEDT, went home to be with the Lord March 29th, 2019. He was born in Lyons, KA, then moved to Fayetteville, AR his senior year of high school. He served in the US Navy as part of the Sea Bees during WWII in the Pacific Islands. After being honorably discharged, he came home to marry Gayle Marie “Phillips” Knackstedt. They were married 59 years. They moved to Bakersfield, CA in 1954 and remained there for 30 years until their retirement in Rogers, AR in 1986. After Gayle’s passing, he remarried Edith Pack in 2013 until her passing in 2017. Leslie was employed in the air conditioning trade for 40 years. 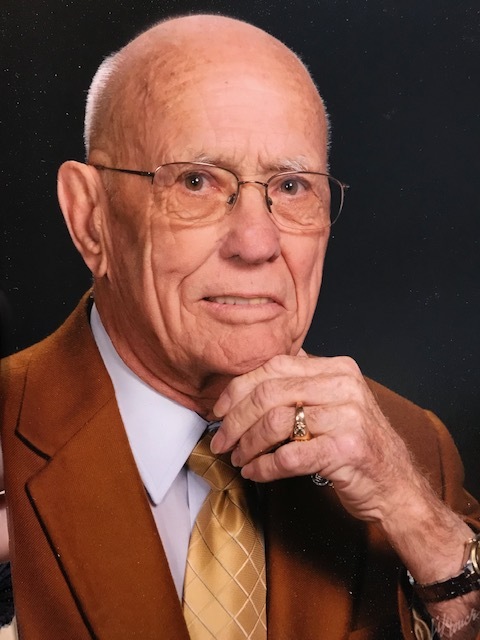 He was a life-long member of First Christian Church, Disciples of Christ in Bakersfield and Rogers. He was a 32° Mason, participated in the Shriners, and volunteered in the Coast Guard Auxiliary at Beaver Lake in AR. Although Dad always showed a tough exterior, he was loving and kind hearted. His family will always remember his sense of humor, hard work ethic, and love for wine. Leslie is survived by his son, Gary and his wife Christine of Stockton, CA; and his daughter, Karen Davis and her husband Larry of Bakersfield, CA. He is also survived by 10 grandchildren and 9 great-grandchildren. Graveside services will be held at 11:00AM, Monday, April 29, 2019 at the National Cemetery in Fayetteville with military honors provided. Donations may be made to the Shriners’ Hospital in his memory. There's still time to send flowers to the Graveside Service at the Fayetteville National Cemetery at 11:00 AM on April 29, 2019.